[pwgt,pbuy,psell] = estimateFrontierByRisk(obj,TargetRisk) estimates optimal portfolios with targeted portfolio risks for Portfolio, PortfolioCVaR, or PortfolioMAD objects. For details on the respective workflows when using these different objects, see Portfolio Object Workflow, PortfolioCVaR Object Workflow, and PortfolioMAD Object Workflow. [pwgt,pbuy,psell] = estimateFrontierByRisk(___,Name,Value) adds name-optional name-value pair arguments for Portfolio or PortfolioMAD objects. To obtain efficient portfolios that have targeted portfolio risks, the estimateFrontierByRisk function accepts one or more target portfolio risks and obtains efficient portfolios with the specified risks. Assume you have a universe of four assets where you want to obtain efficient portfolios with target portfolio risks of 12%, 14%, and 16%. This example uses the default 'direct' method to estimate the optimal portfolios with targeted portfolio risks. Use estimateFrontierByRisk to estimate optimal portfolios with targeted portfolio risks. The estimateFrontierByRisk function uses the MINLP solver to solve this problem. Use the setSolverMINLP function to configure the SolverType and options. 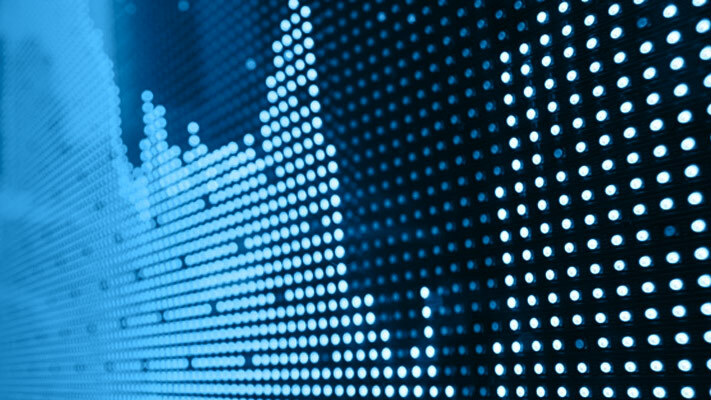 To obtain efficient portfolios that have targeted portfolio risks, the estimateFrontierByRisk function accepts one or more target portfolio risks and obtains efficient portfolios with the specified risks. Assume you have a universe of four assets where you want to obtain efficient portfolios with target portfolio risks of 12%, 14%, and 16%. This example uses the default'direct' method to estimate the optimal portfolios with targeted portfolio risks. The 'direct' method uses fmincon to solve the optimization problem that maximizes portfolio return, subject to the target risk as the quadratic nonlinear constraint. setSolver specifies the solverType and SolverOptions for fmincon. To obtain efficient portfolios that have targeted portfolio risks, the estimateFrontierByRisk function accepts one or more target portfolio risks and obtains efficient portfolios with the specified risks. Assume you have a universe of four assets where you want to obtain efficient portfolios with target portfolio risks of 12%, 20%, and 30%. To obtain efficient portfolios that have targeted portfolio risks, the estimateFrontierByRisk function accepts one or more target portfolio risks and obtains efficient portfolios with the specified risks. Assume you have a universe of four assets where you want to obtain efficient portfolios with target portfolio risks of 12%, 20%, and 25%. This example uses the default 'direct' method to estimate the optimal portfolios with targeted portfolio risks. To obtain efficient portfolios that have targeted portfolio risks, the estimateFrontierByRisk function accepts one or more target portfolio risks and obtains efficient portfolios with the specified risks. Assume you have a universe of four assets where you want to obtain efficient portfolios with target portfolio risks of 12%, 20%, and 25%. This example uses the default 'direct' method to estimate the optimal portfolios with targeted portfolio risks. The 'direct' method uses fmincon to solve the optimization problem that maximizes portfolio return, subject to the target risk as the quadratic nonlinear constraint. setSolver specifies the solverType and SolverOptions for fmincon. If no initial portfolio is specified in obj.InitPort, it is assumed to be 0 so that pbuy = max(0,pwgt) and psell = max(0,-pwgt). For more information on setting an initial portfolio, see setInitPort. Target values for portfolio risk, specified as a NumPorts vector. If any TargetRisk values are outside the range of risks for efficient portfolios, the target risk is replaced with the minimum or maximum efficient portfolio risk, depending on whether the target risk is below or above the range of efficient portfolio risks. 'direct' — Construct one optimization problem to maximize the portfolio return with target risk as the nonlinear constraint, and solve it directly using fmincon, instead of iteratively exploring the efficient frontier. For an example of using the 'direct' option, see Obtain Portfolios with Targeted Portfolio Risks for a Portfolio Object Using the Direct Method and Solver Options and Obtain Portfolios with Targeted Portfolio Risks for a PortfolioMAD Object Using the Direct Method and Solver Options. 'iterative' — One-dimensional optimization using fminbnd to find the portfolio return between min and max return on the frontier that minimizes the difference between the actual risk and target risk. 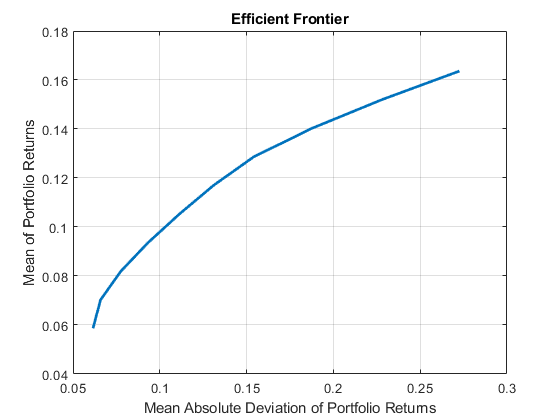 Then the portfolio weights are obtained by solving a frontier by return problem. Consequently, the 'iterative' method is slower than the 'direct'. Optimal portfolios on the efficient frontier with specified target returns from TargetRisk, returned as a NumAssets-by-NumPorts matrix. pwgt is returned for a Portfolio, PortfolioCVaR, or PortfolioMAD input object (obj). If no initial portfolio is specified in obj.InitPort, that value is assumed to be 0 such that pbuy = max(0,pwgt) and psell = max(0,-pwgt). You can also use dot notation to estimate optimal portfolios with targeted portfolio risks.